With his reelection as LDP president, Shinzo Abe appears to be immovable. The recent reelection of Japanese Prime Minister Shinzo Abe as the president of the ruling Liberal Democratic Party (LDP) in Japan means that he will continue as the head of that party through September 30, 2018. Abe’s reelection is significant in more ways than one. No other leader of the LDP has been elected unopposed since 1997. So what does Abe’s reelection mean for Japanese domestic politics and for the country’s foreign policy? First, it means that in spite of the disaffection among many sections of the Japanese populace over Abe’s insistence on passing controversial security legislation, his popularity remains strong. When finally passed into law (by the end of the current session of the Diet on September 27), these bills stand to allow Japanese troops to fight on foreign shores for the first time since the Second World War. Second, it means that there is no one within the LDP who can challenge Abe. The only other “potential” rival candidate, Seiko Noda, had to drop out of the race as she could not gather the support of the requisite number (20) of LDP Diet members. Third, it means that Abe now has a renewed mandate to carry on his so-called programme of economic revival, more popularly known as “Abenomics,” which brought him to power in the first place. Fourth, it means that this victory will allow Abe to carry on with his bold steps in the field of nuclear energy, as exemplified by the restarting of reactor number one at Sendai, run by Kyushu Electric Power, earlier in August this year. Relations with another neighbour, South Korea, have not seen the best of times either. In a significant development, South Korean President Park Geun-hye attended the military parade organised by Beijing on September 3, despite the fact that both Japan and South Korea are staunch U.S. allies. On the other hand, it means that Japan’s relations with the United States and countries like Australia and India will continue to be strengthened, as Abe has devoted a significant amount of political capital toward improving Japan’s ties with these countries. Meanwhile, Japan, for the first time, is in negotiations to sell the Japanese-made ShinMaywa US-2 maritime reconnaissance aircraft to India. This came after Abe relaxed a self-imposed ban on the export of weaponry. Japanese companies are also in the running (along with French and German companies) to build six to twelve submarines for the Royal Australian Navy (RAN) in a lucrative contract worth 50 billion AUD ($38.84 billion). 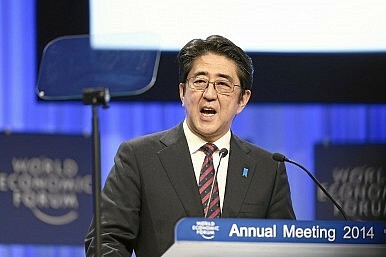 However, there are quite a few challenges that Abe faces going forward. Besides the contentious security package legislation in focus, there is also an ongoing debate over the relocation of U.S. bases in Okinawa. In addition, the TPP negotiations are also at a delicate stage. In addition, there have been a series of gaffes in the run-up to the Tokyo Olympics, to be held in 2020. Japan has already dumped the original stadium design because of spiraling costs while recently the logo of the Tokyo Olympics has also been scrapped because of plagiarism allegations. Hence, although Abe’s re-election has, no doubt, strengthened his hand, the next few months are not going to be easy for the prime minister. Abe will surely end up in the history books if he remains prime minister until September 2018, which would make him the third-longest serving prime minister of Japan in the post-war era. He already has many other firsts to his credit, like being Japan’s youngest post-war prime minister and the first to be born after the war. Whether he will reach this milestone, however, only time will tell. Dr Rupakjyoti Borah is currently a Visiting Scholar at the National Chung Hsing University, Taiwan and a former Visiting Fellow at the Japan Institute of International Affairs (JIIA), Tokyo. The views expressed are personal. Follow him on Twitter @rupakj. The reshuffled Japanese cabinet from August 2017 will remain in place following the LDP's general election showing.